With all the ongoing dramas over the Great British Bake Off this new card that I launched in September has proven to be very popular. I love the image (it’s one of those designs where I came up with the punchline within about three minutes of seeing it) and I must admit it speaks to be as a vegan skeptic. I mean I eat vegan food often, not because I need or want to but because I just don’t think about it. But one area of cooking where I find it difficult to realise is baking. I’m not an avid baker myself – it’s far too precise for my “see what I’ve got and chuck it together in a pan” method of cooking. But every now and then when I crave something sweet and comforting a little cake or tray bake is just what I need. My belly doesn’t but that’s another story. Gluten free vegan can’t be that bad can it so I gave it try based on a recipe from Running with Spoons and I was pleasantly surprised. They’re a little bit grainy but that might have been too much powdered almonds but otherwise they were nice and dense and sweet – even the vegan chocolate was absolutely fine. 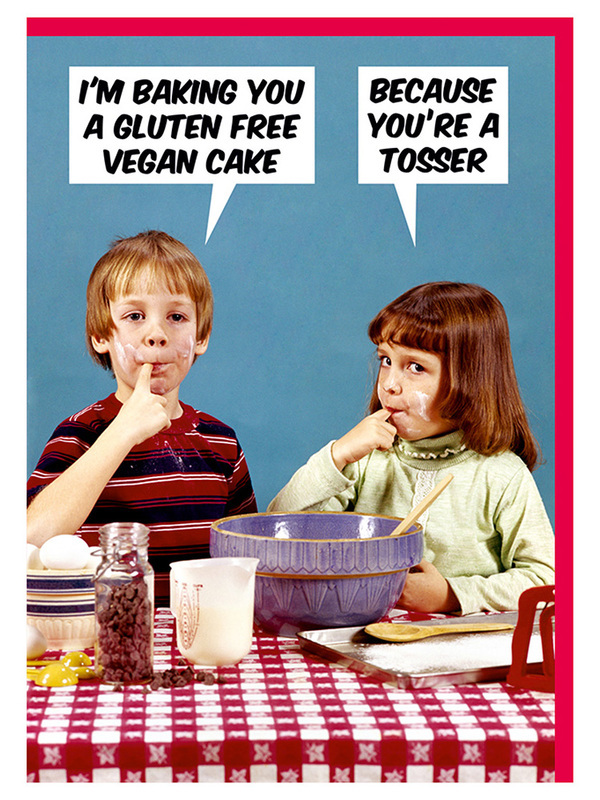 So I still think this card is a funny one but maybe not all vegan baking is as joyless as I once thought.